This book is filled to the brim with ideas . . . hints . . . suggestions for creating a party in which your friends will feel at ease, have fun and be talking about the "event" for weeks afterward. My, if the party is truly successful, they'll be questioning when you'll be holding your next one. Go ahead and dig in. Use this book in any way you believe it'll help you to be a better host . . . throw a thoroughly enjoyable party where all the guests have a great time . . . and you, too, feel at ease enough to enjoy yourself. To that end, you may want to read the entire book once. Then depending on your questions or type of party you're hosting, return to various parts of the eBook as you plan. 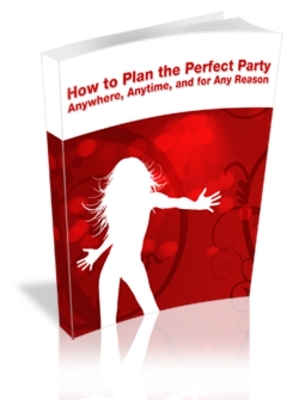 This book covers just about every aspect of party planning one could imagine. Chapter 1 starts out by asking that age-old philosophical question: Why party? The subtext to that question: For what purpose are you creating this gathering? Answer that question and much of your party plans take a natural course of their own, as you'll soon see. Chapter 2 delves into the step-by-step detailed planning that absolutely necessary to make your party successful and . . . well, ironically enough, effortless. If you plan sufficiently ahead of time, you'll look as if you pulled it all together with a mere wiggle of your nose. Follow these great suggestions and time lines and you'll be assured that your guests will have a great time! Common questions many would-be hosts ask me deal with food. What's best to serve? How much to serve? How do I serve. Or the question I love: "Look at these two forks! They're different sizes!When do you use one or the other?" To discover the ins and outs of feeding your guests, turn to Chapter 3. I'll not only tell you how much food to plan (neatly outlined in a table in an appendix in the back of the book), but I'll even give you tips on how to serve your guests. Follow these directions and your guests will never ever believe that at the beginning of the planning process you ever doubted yourself! Once you have a handle on the nuts and bolts of party planning, you need to give some thought -- even before the party begins -- on what it takes to be a good host. Yes, it's more than just laying out a great spread or bringing a good group of people together. To discover what it takes to be a good host, just turn to Chapter 4. You'll learn that your duties as host begin even before the first guest steps through that door. But don't worry, once you learn the basics -- which are easy to handle -- you'll walk into the job like it was created just for you. Part of the very important duties of host is making sure that the party keeps moving. Every party needs a flow and as host it's your job to supply it. Just check out Chapter 5 to discover how to keep any party from getting stuck in one room or revolving around one (usually boring) person! Well, just when you think we've covered all the aspects of The Perfect Party, we've added one more element: Party planning on a budget. And finally, the last chapter gives you some creative ideas about throwing a "theme" party. These parties -- which can be some of the most memorable your guests will ever attend -- can be easily (and many times quite economically) created. You have to review these. Feel free to use any of these ideas. Or perhaps these suggestions will get you thinking in even more creative directions. But, that's not all that's in this book. I've included two "must-read" appendices. The first is really a "must-use" appendix. It provides you with a pre-party planning check list to keep you right on track from the moment of creation till the time that first guest walks through that door. The second appendix is a food calculator. Now, you don't have to guess about the amount of food you need to buy for your party. This chart at least gives you a ballpark figure to work with! You'll Also Receive These FREE Bonus Gifts! This is the party-planning recipe book you've been waiting for! What? You didn't realize it? Well, once you finish looking over the recipe suggestions in this booklet, you'll realize that it just might be . . .
Now, what are you waiting for? It's time to plan a party -- with flair! Thanksgiving Party - 25 Plr Articles Pack!